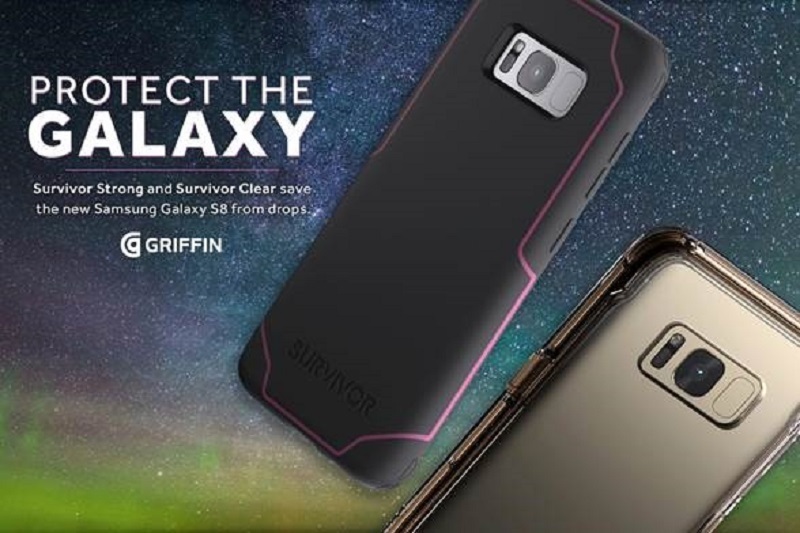 Griffin Technology, creator of award-winning and thoughtfully designed mobile accessories, today announces the Survivor Strong and Survivor Clear cases for the highly anticipated Samsung Galaxy S8 and Samsung Galaxy S8+ devices, immediately following the recent Samsung Galaxy UNPACKED 2017 event. Griffin’s range of cases offer unparalleled protection and sleek designs to complement the innovative features of the next generation Samsung Galaxy devices. Leading Griffin’s collection for Samsung Galaxy S8 and Samsung Galaxy S8+ is the ultra-slim Survivor Strong. Built to meet or exceed Military Standard 810-G standards for durability and protection, Survivor Strong offers unmatched drop protection without bulk. Weighing in at less than 2 ounces, Survivor Strong is light, but delivers heavy-duty protection from 7 foot (2.1 meters) drops onto concrete. The dual-material snap-on shell is designed with Griffin’s proprietary Impact Dispersion System to protect the device securely within its shatter-resistant shell, keeping it safe from impacts. To keep the Samsung Galaxy S8 and Samsung Galaxy S8+ safe, users need something strong, Survivor Strong. Survivor Clear is one of Griffin’s slimmest Survivors ever while still delivering the same legendary Military Standard 810G protection from 4 foot (1.2 meter) falls. Composed of optics-clarity polycarbonate, the high-gloss case wards off scratches and looks newer longer. Survivor Clear’s impact-deflecting bumper protects the Samsung Galaxy S8’s sides and corners with anti-yellow rubber that maintains its impeccable clarity longer than other see-through cases. Allowing users to show off the sleek design and form of their new Samsung Galaxy S8 and Samsung Galaxy S8+, Survivor Clear offers ultimate protection without getting in the way of the devices’ stunning screen. Rounding out Griffin’s case collection for Samsung’s newest Galaxy is Reveal. The unbelievably slim polycarbonate case lets the Galaxy S8’s beautiful design shine through, but protects against impacts and scratches. Adding barely over a millimeter of thickness, Reveal protects with thin rubber edges that cushion the phone and give users a secure grip. Griffin’s USB-C power and connectivity solutions are readily available to support the latest functionality of the Samsung Galaxy S8 and Samsung Galaxy S8+ devices. Users can stay prepared and powered up with Griffin’s USB-C PowerBlock SE, USB-C to Micro Cable, USB-C to USB-A Cable, and USB-C to USB-C Cable. Not only does Griffin offer protection for the Samsung Galaxy S8 and Samsung Galaxy S8+, also accessories to outfit the device ensuring it is powered up and ready for use. The USB-C PowerBlock SE is built to last with its power strip-friendly compact design. Keeping the Samsung Galaxy S8 and Samsung Galaxy S8+ charged up and connected, the USB-C PowerBlock SE delivers up to 15 watts of charging with its heavy-duty 4 foot (1.2 meter) cable integrated with the power supply, so users are never left looking for their cable. Griffin knows how important it is to stay connected and users can rely on their USB-C to Micro Cable, USB-C to USB-A Cable, and USB-C to USB-C Cable to connect the Samsung Galaxy S8 and Samsung Galaxy S8+ with multiple devices including backup batteries, laptops, and other USB-C enabled devices. Survivor Strong, £29.99, for Samsung Galaxy S8 and Samsung Galaxy S8+ will be available in late April 2017. Color options will include Black/Gray, Navy/Coral Blue, Arctic Gray/White, Arctic Gray/Pink, Black Tint, Blue Tint, Pink Tint, and Clear. Survivor Clear, £19.99, for Samsung Galaxy S8 and Samsung Galaxy S8+ will be available in late April 2017. Color options will include Black/Smoke/Clear, Blue/Black/Clear, Arctic Gray, Gold, Coral Blue, and Clear. Reveal for Samsung Galaxy S8 and Samsung Galaxy S8+ will be available in late April 2017. Griffin’s USB-C PowerBlock SE, £30.00, USB-C to Micro Cable, £14.99, USB-C to USB-A Cable, £14.99, and USB-C to USB-C Cable, £14.99 are now available online.